Okay, you’ve got me there. I’m supposed to be looking for schlock (and finding the value in it), and Bill, the Galactic Hero is the opposite of that. It’s a classic satirical staple of the genre. I get that. So why did I read it? I’m gonna be honest, I’m not sure I know the answer to that. It mostly comes down to the fact that my roommate and I were talking about another Harrison classic, Make Room! Make Room! It’s the basis for the movie Soylent Green. I hadn’t read that one either, so I was surprised to find out that in that book, Soylent Green is not, in fact, people. That conversation got me thinking that I had a copy of Bill, the Galactic Hero floating around somewhere and that I’d been meaning to read it for a while. In fact, a comment on another review from reader wileequixote suggested I read it back in 2013, so I guess it was about time I did what I said I would do and actually read the damn thing. And because I find it difficult to read science fiction anymore without automatically formatting it into a review structure, here we are. For me, the clincher that says I would have gotten along with him is that he was an avid Esperantist. This shows up in several of his novels, but not this one. I guess I’ll have to read the Stainless Steel Rat series. Oh my, what a sacrifice! Some of the things I’ve read about this book say that it was a satire on Starship Troopers, while others say that it was more in line with some of Isaac Asimov’s military sci-fi output. Without knowing anything that Harrison may have said, I’m more inclined to believe the latter. The thing that surprised me, then, is that this book is not entirely about the military. Yeah, military ineptitude takes up a large part of this book, but I got the feeling that Harrison was casting a wider net than that. The military aspect is Harrison’s way of taking the piss out of bureaucracy, government, the aristocracy, and good old human ineptitude. And he does it very well. The titular Bill is a farmer on a backwoods planet. He’s learning how to become a Technical Fertilizer Operator, and he’s quite happy in his work. One day he notices a big to-do going on nearby and goes to see what’s up. It turns out to be a military parade, full of pomp and circumstance, and Bill is dazzled by the display. A recruiter notices that Bill is big, strong, and dumb, making him perfect recruit material, so he drugs him and shanghais him into the service. Everything starts going to crap immediately. The crisp uniform they put him in turns out to be made of paper, and falls off before Bill even shows up to the ship off-world. The medals they pinned on his chest are made of cheap metal and fall apart. Bill survives boot and is sent to a massive spaceship, the Christine Keeler. I had to look up what the name was referring to, and here’s the Wikipedia page so you don’t have to look it up yourself. The ship is called the “grand old dame of the fleet” just before it’s mentioned that she’s all of a week old. Bill’s job is to replace fuses. Said fuses weigh about ninety pounds. They have a red band on them that turns black when they need replacing. Bill learns these two facts in a “crash course” that usually takes weeks, but since there’s a war on they have to hurry along. I’m telling you, this book never lets up. Everything about everything is an example of sheer ineptitude. All the officers on the ship are as stupid as can be, up to and including the captain, who, because all ship captains have to belong to the nobility, is a ten-year-old (there’s not enough nobility to go around sometimes) and is mentally disabled (from countless generations of inbreeding). There’s a space battle and the fuses in Bill’s department explode, killing all the fuse tenders but him. In a daze, he wanders around the ship until he finds a chair. Next to the chair are some green and red lights on a screen, with a note saying “Target the red lights.” Bill figures what the hell, puts the targeting reticule over one of the red dots, hits a promising-looking button, and the light goes out. A nearby officer sees this happen, calls Bill a “fighting fool,” and declares him a great hero of the war. It was at that point that I just about crapped myself laughing. This is so brilliant I can’t even stand it. Being a hero means getting leave to visit Helior, the capital city of the Empire. Like everything else in the book, Helior turns out to be a hollow showpiece. The planet looks like it’s plated in gold, but it turns out to be aluminum. He’s awarded a medal from the Emperor, but it turns out to be an actor and the medal is made of pot metal. The planet-sized city is so vast and complicated that people are issued a floor plan on arrival. Losing the floor plan is a grave offense, as is basically everything else. Bill’s, of course, gets stolen. The military satire starts to fall away here and in turn is just regular bureaucratic satire. A series of adventures leads Bill down to the bottom level of the planet-city, where he is hired as a garbage technician. The planet has a massive garbage problem, largely in the form of plastic food trays. Bill works for the R&D department, trying to figure out how to get rid of all this garbage. Previous attempts to rid the planet of its garbage included teleporting into a star, but it turned out there was so much of it that the star went supernova. Bill’s plan is to package up plastic trays and send them via mail to people on backward planets as “gifts.” Since it’s a government office, postage is free. Robots do all the work. The plan is hailed as genius. All the while, Bill is also being recruited by a revolutionary front who wants to overthrow the Emperor. He’s also approached by an agent of the Galactic Bureau of Investigation who wants him to infiltrate said revolutionary front and report back to him about it. He eventually discovers that every single member of this revolution is, in fact, a double agent working for the GBI, up to and including the leader. It’s because of this that Bill is caught and turned back over to the military, who court martials him for deserting his post. His lawyer successfully argues that since Helior is a planet under martial law, Bill never actually deserted his post in the first place. This gets Bill off the hook for that part, but the judge then states that since Bill was technically on-duty for the entire year that he was on Helior, and because it was obvious that he slept at least once during that year, he is guilty of sleeping on duty. The punishment is compulsory re-enlistement. So this thrusts Bill back into the service, fighting on a swamp planet called Veneria. The book wraps up with Bill learning that there’s a shortage of replacement feet on this planet and casually blows his own foot off with a rifle. He gets to leave. The epilogue features Bill going back to his homeworld as a recruiter. He recruits his own brother to enter the service, seeing as how every successful recruitment will remove one month from the time he has to serve. It’s a dark ending, and compared to the rest of the book, it was a lot like getting to the final episode of Black Adder Goes Forth in terms of tonal shift toward complete darkness. It floored me. That’s the book, although so much happens in it that I probably left out your favorite part. I left out the bit about how Bill has two left arms, and while that’s displayed on the cover of this edition, it’s not displayed accurately. For one, he doesn’t have both arms on the same side, it’s just that they replaced his lost right arm with a left arm. The primary perk of this, he relates, is that he can now shake hands with himself. I’m…not sure how that works. Other wacky things include Bill’s religion, Fundamentalist Zoroastrian, and one of his fellow soldier’s attempts to get him to join the First Reformed Voodoo Church. There’s just so much going on here. There were lots of times when I was certain that this book had a major influence on Douglas Adams. The satire was pretty similar in lots of places. I can’t find any evidence of that, so maybe they were just working from the same place. Even the way the plot worked―a hapless schmo getting bounced around from wackiness to wackiness—reminded me strongly of The Hitchhiker’s Guide, although with a more direct target for the satire. While Douglas Adams was mostly goofing on people and stupidity in general, Harry Harrison’s satire was more focused on inept people in power and the stupidity of organizations. At times I got a little frustrated with how “wacky random” the book was. This is more my problem than the book’s problem, and it didn’t go overboard and make me dislike it at all. The good parts of the book outweighed the occasional punny-goofy names and so forth. Oh, I forgot to mention how space travel works in this book! How silly of me! It’s great. Ships get from place to place via a thing called “Bloat Drive.” The book describes the workings behind it with an analogy: take a rubber band in your left hand, grab it with your right hand, and without moving the left hand, pull on it with your right. Let go with your left hand. The rubber band has moved. Yeah, ships move by stretching out and then shrinking back again. Earlier I said that some people feel this book was satirizing another specific author or work, whether Heinlein or Asimov, but the more I think about it, I think it was a lot bigger than that. Like Norman Spinrad, I think Harrison had some things to say about science fiction in general. Yes, the main target of his satire was real life issues, but there are so many works of science fiction that treat a lot of what Harrison touches on as good things. 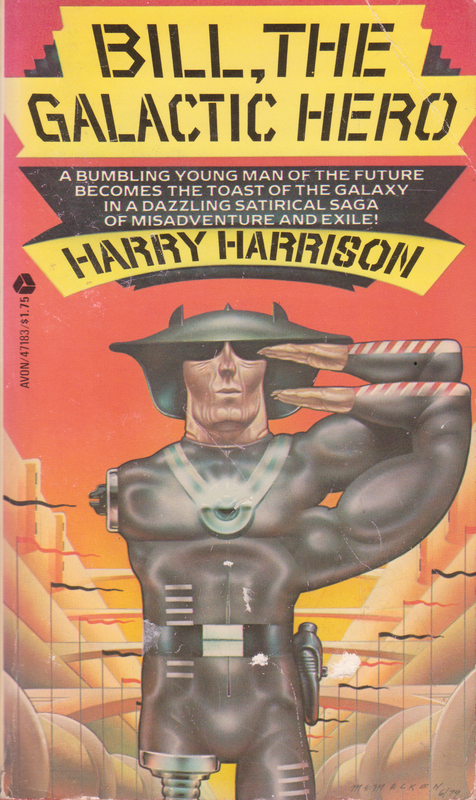 Lots of pulp works idealize the military, galactic empires, world cities, and so on, and Harrison is letting us peek behind the curtain and see that real problems that so many of these things would have if real. The military can be cruel and dehumanizing, galactic empires can degrade into useless and idiotic aristocracy, and world cities generate a hell of a lot of garbage. The main difference between the two authors is tone. While Spinrad felt like he was coming from a place of bitter anger in his satire, Harrison seems like a happier guy who is just playing around. At the same time, though, he touches on some very real issues and casts them in the absurd light that they probably deserve. Folks, this book was genius. What fun you obviously had, and for me it was a trip down memory lane to when I myself fell around laughing while reading this book. I’d say the satire is more of Starship Troopers and its ilk than of anything Asimov ever wrote. I’d steer clear of the sequels, though. Yeah, what realthog said. I’d always thought ‘Helior’ was a spoof on Azimov’s ‘Trantor’ from The Foundation series. But then again the world-spanning city was a pretty common trope back then. I’d always thought ‘Helior’ was a spoof on Asimov’s ‘Trantor’ from The Foundation series. If you want more wacky satire from HH, you could do worse than looking at “Star smashers of the galaxy rangers”, which is a wonderful parody of classic space opera (it’s been described as “E.E Doc Smith on laughing gas”). The Stanless Steel Rat series is a lot of fun as well, but much more restrained with the “wacky” elements.